Just when I think I’ve read every possible historical fiction angle on the WWII era, that there can’t possibly be another tale to tell, a new one comes along and knocks my socks off. Labeled a traitor, young Anke has been placed in one of Nazi Germany’s camps. She uses her skills as a midwife to help women around her, providing what comfort she can. But when word of her skill reaches higher up, she finds herself being placed in a most unlikely situation. Her services are needed to serve the cause and the Fuhrer himself. You see, there’s a baby on the way. And this baby is very important to the Nazi future. Of course she doesn’t want to do it, but her survival instincts kick in not only for herself but for her family back in the camps. And at the heart of it all, she’s a midwife. So this is what she does. This book…is so many things. It’s historical and a love story and a story of friendship and hope and so much more. If you’re a fan of the genre, don’t pass this one up! That’s the backstory. The main story is: I ABSOLUTELY LOVE THIS BOOK. 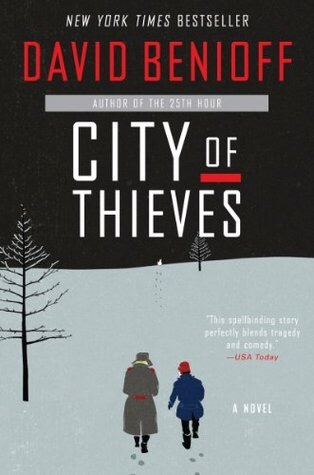 City of Thieves is about two guys who normally wouldn’t be friends, thrown together for a week-long hunt for eggs during the German siege on Leningrad. It was a cold week for those young men. They almost die several times. They daily encounter other people’s death. And they fail over and over at finding eggs. But they find something else. They find humanity in desolation and desperation. They find friendship. They find courage. One of the men finds humor in everything (thankfully, because I frankly needed the comic relief). The other finds love. And that’s the best part of the whole thing… That LOVE can be found even in the wasteland of hate and war. That there’s a love story here FLOORED me and satisfied me to no end. Oh and it’s a TRUE one. TRUE love. Sigh. As for the eggs: they can be had for a small wager, but they are no prize. Stories like this are the reason I continue to love historical fiction. Skilled authors are able to take an event or era from the past and weave an intricately compelling story around it. Granted, there’s no shortage of stories set in Nazi Germany, but this one is definitely a must-read if you’re a fan of the genre. It’s the early 1970’s, and Hannah must come to terms with her mother’s recent death. Not particularly close to her in life, she now is faced with the task of clearing out her mom’s house and possessions. A job to be completed as quickly as possible so that she can get back to her life. Until she comes across some mysterious letters, that is. And so her quest takes her all the way to Germany where she meets a grandfather she had no idea even existed. And she’s a surprise to him as well. Hannah is as determined to find out her family secrets as her grandfather is determined to keep them forever hidden. As she digs deeper, she finds out so much more than she bargained for. And she discovers the person her mother truly was. Much of the appeal of this story, as is the case with most historical fiction, is that it’s told from two perspectives spanning several decades. What Hannah is feeling is entirely justified, but hearing her mother’s story puts a whole new spin on things. An excellent story with the reminder that things aren’t always what they seem! If you asked me what my preferred genre is, I’d be hard pressed to narrow it down to just one. However, historical fiction ranks at the top of that list. I love a book that tells a great story while also teaching me a bit of something new. That’s why some of my favorite books of all time include The Book Thief and The Orphan Train. It’s for that very reason that this book by Jana Kinser caught my eye. Nazi Germany was a terrifying place for all, but especially for young children. Their safe, secure world was turned upside down as they were targeted for nothing more than being Jewish. Homes and livelihoods were destroyed, families were separated, loved ones lost their lives. All because of something they had no control over. But there was hope for many of the children in the form of selfless volunteers who risked their lives to help these children escape and have a chance at a somewhat normal life. For the most part, this story centers on young Peter. He and his family have a happy, secure life in their comfy little apartment above their butcher shop. That all comes crashing down when the Nazis invade their small town taking over everything. Suddenly, being Jewish is a crime, punishable by death even. Peter and his family find themselves without a home along with many others. When the chance to escape presents itself, Peter and his younger sister take it. On the Kindertransport they go, off to a better life. Their journey is not without risks, though, as the war rages on. There are other characters, of course. And their stories are just as important. There’s young Eva, the apple of Peter’s eye. She has a ticket on the train to freedom but her older brother has a different idea. Stephen and Hans are sent on the train to safety by their respective families. And then there are the tragic stories of those left behind, children who didn’t get a seat on the train as well as adults not able to escape. This was an incredibly engaging story for me because I had no idea such a thing existed. 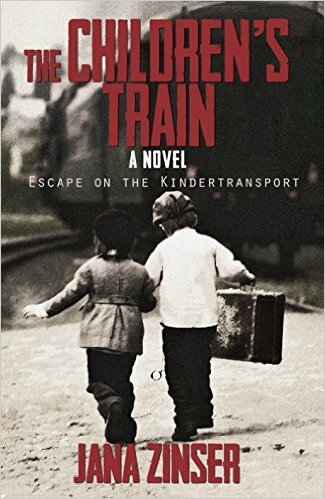 The Kindertransport was something new that I’m now highly motivated to learn more about. For that reason alone, it was a book I just couldn’t put down. The characters and storylines were good as well, although I did feel that many of the deaths were described too matter-of-factly. Still, a great story about an interesting subject!